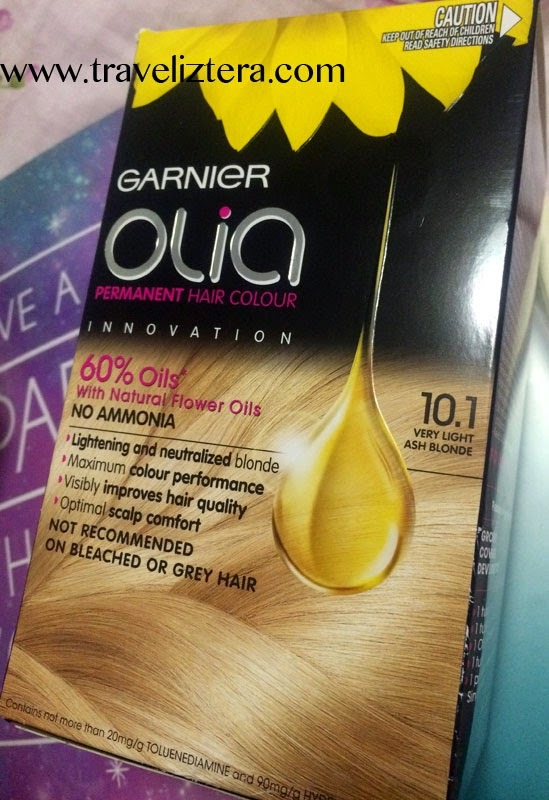 This is the second time I'm using Garnier OLIA to colour my hair. 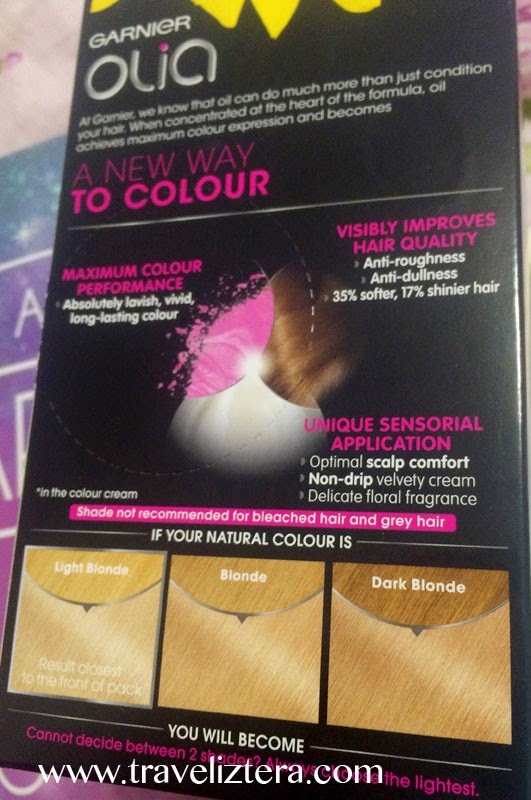 I usually use L'oreal in colouring my hair, but I felt like trying this brand again, because I saw my old review about this brand with the Beige Dark Blonde shade. Anyway, I always use Ash Blonde shades to turn my hair into a very light brown shade, or a dark blonde shade. Thus, I wanted to try the shade that Garnier was offering, especially with the fact that I had a good experience from a past usage. Well, in this post, you'll see how it colours black, dark brown, and blonde hair, because my black hair has shown up, and I originally had a dark brown to blonde ombre, but the colours have turned yellowish and brassy. 3-in-1! Garnier Olia has 60% oils to keep your hair soft while colouring. The back part of the box has a cutout to create a hole for your bottle to stay upright. Based on the instructions, I mixed it all in and kept it on my hair for 45 minutes, even though the instructions said 30 minutes. My hair is really thick and stubborn that it has to be more than 30 minutes. During the process, I was surprised that I didn't smell any harsh or strong scent. I'm so used to other dyes, wherein the smell really irritates the lining of my nose, and it just goes straight to my head, and I get a headache from the smell. This brand just didn't have that smell. There might have been a subtle one, but I didn't notice it until I started washing it off. Since there was no harsh scent, I definitely didn't feel any sting on my scalp. The consistency is that of a conditioner. It's not too thick, and it doesn't make your hair sticky and difficult to brush through once it's on your hair, unlike other brands. After the process, I washed it off with the included conditioner, and it left my hair soft and combable. I was honestly surprised and impressed, because like I said, I'm used to other hair dyes that I know would dry my hair right away. As you may have noticed, in the BEFORE photo, my hair is just... a mess. The dark areas in my hair are basically my black hair showing up, and then I have these varying shades of yellow ombre. 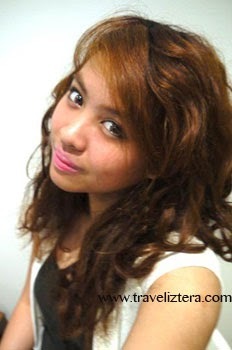 Originally, I had a dark brown-blonde ombre. 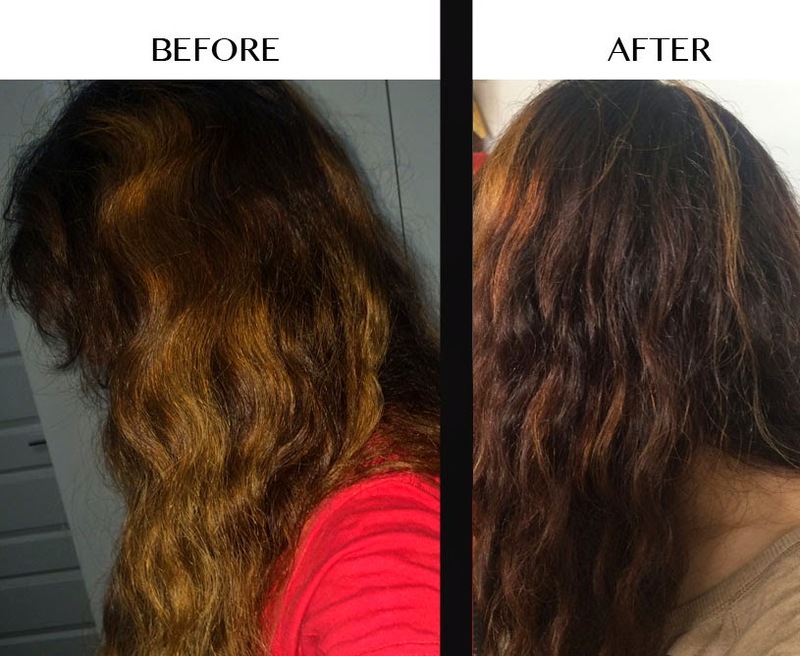 In the AFTER photo, my black hair has turned into a dark brown shade, and you can see that the yellow shades have been toned out to create a shade of beige brown/beige dark blonde. The dark brown areas stayed dark brown, but it's more chocolatey in terms of the shade. Now, despite not meeting the expected hair colour that I got from its counterpart in the L'oreal range which is the Extra Light Ash Blonde colour, I'm happy with the outcome. As you may have noticed, the shade it did to my black hair is really light, compared to the effect that Garnier Olia did to my black hair. However, I must say that this time around, I like how it helped me in my ombre. 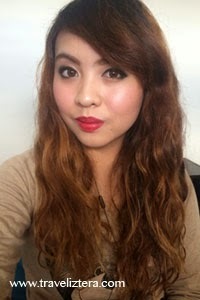 It may not have lightened my hair like how L'oreal did, but it helped in toning my ombre. Leaves your hair soft and combable. Good as a toner to yellow/brassy shades. Consistency is that of a conditioner, and does not stick your hair together. Does not dramatically lighten black/dark hair like another brand's similar shade.